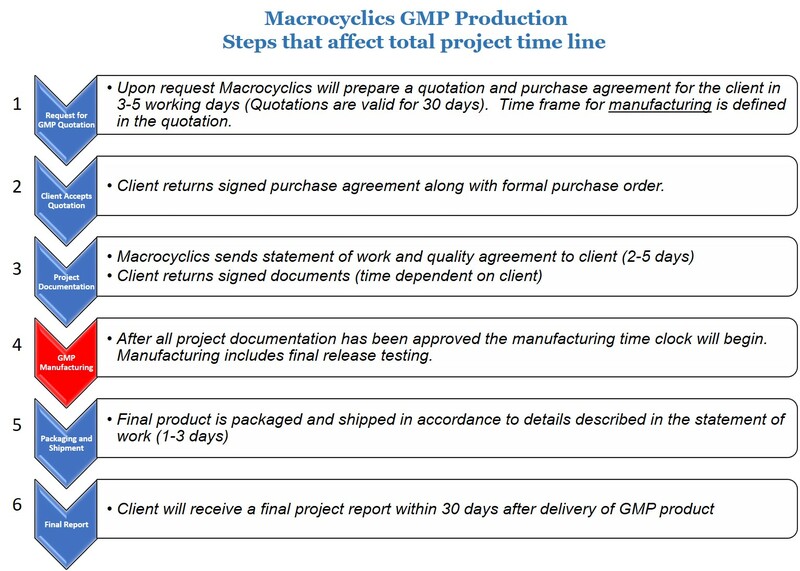 Macrocyclics introduced its cGMP manufacturing services in 2005. Our quality system is designed specifically for the manufacture of APIs to be used in clinical trials. These cGMP services can be applied to our in-house line of catalog products or custom syntheses for particular client needs. Our staff, with over 80 years of cumulative experience in the field of ligand design and chelation chemistry, will oversee process development for all custom projects with a keen awareness to downstream scale-up and cGMP requirements. Prior to the start of a cGMP production campaign, our scientific staff will work closely with the customer to develop a QA protocol, product specifications, batch record generation, and a timely delivery date. Our cGMP philosophy is dedicated to providing a tailored, cost effective alternative for customers with small scale production needs ranging from the milligram to kilogram scale. Macrocyclics’ clients are international and include government agencies, scientific investigators, biotech and pharmaceutical companies many of whom are frequent repeat customers. Feasibility Studies – A feasibility study is conducted on all customer projects that involve a new synthesis or process that has not previously been performed by Macrocyclics. Feasibility studies provide a smooth transition from product development to cGMP production and ensure that procedures are fully optimized with achievable anticipated yields. The feasibility study is performed using the same, materials, personnel, equipment, and instruments that will be used for the cGMP manufacturing campaign. After the process has been developed the results are reviewed with the client so that any necessary improvements or changes can be incorporated into the QA protocol and batch records prior to cGMP manufacturing. Strict adherence to FDA Guidance for Industry Q7A section XIX, APIs for use in Clinical Trials. Consideration is also given to applicable sections of the Code of Federal Regulations Title 21 Parts 210 and 211. Controlled access to cGMP areas. On-site QC and analytical testing labs with qualified equipment – responsible for all QA/QC activities for each cGMP campaign. Creation and execution of production batch records for optimal documentation. Macrocyclics has well-documented SOPs for our quality system, analytical procedures, equipment, and process control. Final product release specifications are created and adhered to. We welcome client audits before the start of each production campaign. 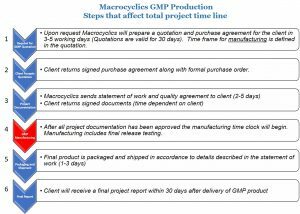 For more information on Macrocyclics’ cGMP quality system, please contact our Head of Quality Assurance, Alicia Staz, +1 (469) 786-6060, alicia@macrocyclics.com.